Sometime ago while researching stories for the spring exhibition at the Gardens, Nature Mother of Invention, I came across the Tjipetir Mystery Facebook page. I was particularly interested in this page as it related to blocks of gutta percha, the latex produced by Palaquium gutta (Sapotaceae family), which will be one of the themes of the exhibition. 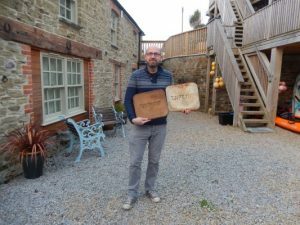 This led me to Tracy Williams, the founder of the Facebook page, and the person who first found a block of gutta percha with the name “Tjipetir” impressed on it washed up on the beaches of Cornwall. 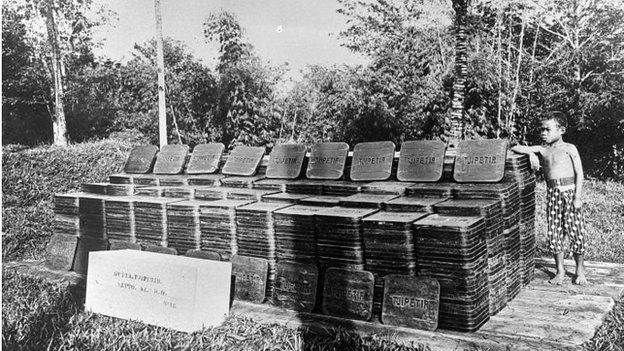 To cut a long story short these blocks were produced at the Tjipetir plantation and factory in West Java, Indonesia, had been on Japanese cargo ship sunk off the Scilly isles during the first world war and had sat at the bottom of the sea for about 100 years before being washed up along the coasts of Europe. As I am currently in Java awaiting final Government approval to collect Sapotaceae specimens from the neighbouring island of Sumatra I took the opportunity to visit the source of these blocks. Together with a colleague from the Bogor Botanic Garden, Prima Hutabarat, we set off early to the village of Cipetir (Tjipetir is the old Dutch spelling). 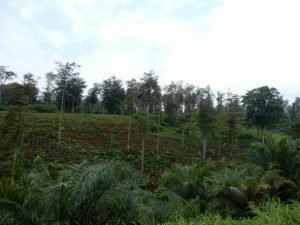 Three hours later we started to ascend into plantation country and see some large trees of Palaquium gutta intermixed with oil palm. Slowly but surely more trees of Palaquium gutta were spotted although it was far from the density that the original plantation would have had. Almost without noticing we arrived at the sleepy roadside village of Cipetir. 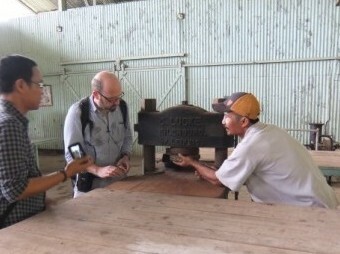 Here we met up with Pak Adin, who had worked as a gutta percha collector for many years and who kindly offered to guide us to the factory. Twenty minutes down a very rough and muddy track we got our first glimpse of the rusting chimney of the factory and the entrance with Cipetir boldly painted on the fading blue factory walls. As we jumped out of the car we were met by Pak Ucup, a current factory worker, who showed us around the area and explained how the material was processed and the blocks produced. 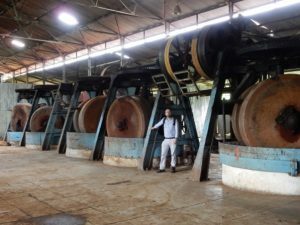 Apparently one tonne of leaves produces only 13 kg of gutta percha! Unfortunately today the demand for the product means that the factory only produces blocks intermittently. Asking about the old Tjipetir blocks and the moulds that made them he said that no one in the village could remember them and that today the product is made into circular blocks without markings. An interesting fact that I had not been aware of before was that the major demand for gutta percha today is for artificial bones! During our visit we saw raw unprocessed material and seedlings of Palaquium gutta about to be planted but unfortunately no material was available for us to bring back for the exhibition. However our colleague from Bogor Botanic Garden, has already set in motion the process of obtaining some seedlings of Palaquium gutta from the plantation, hopefully to be planted in both the Bogor and Edinburgh Botanic Gardens and for some of the final gutta percha product to be sent to us the next time it is in production at the factory. These will be of immense value to the RBGE in telling the public the fascinating story of one species of Sapotaceae. 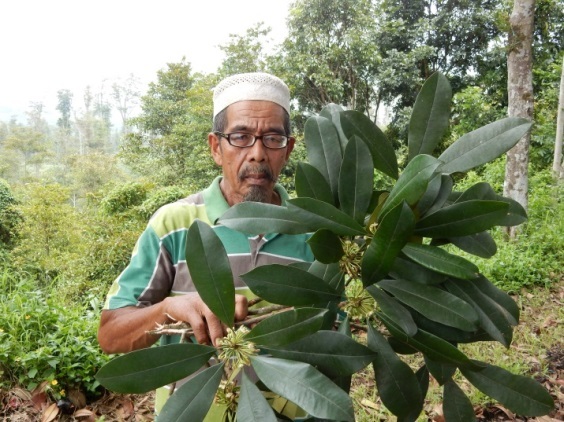 On the way back to the village Pak Adin mentioned that two large trees of Balata, Manilkara bidentata, (also of Sapotaceae) were growing outside his house. This South and Central American species had been planted many years ago as an alternative source of latex but had been found not to be as good. To my amazement when we visited these trees they were in flower. 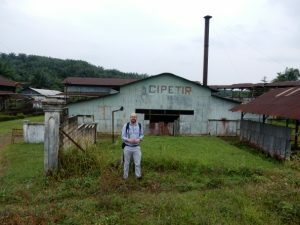 Although the latex of this species was not considered useful at Cipetir, it was considered differently in other parts of the world and also has a very interesting history – but that is for another Botanics story! I have been looking to find the gutta percha pabrik on google maps but with no good luck at all. Can you please give me the coordinates in latitude and longitude for the place? A lot of picture (mostly the same) but this pic was new… 🙂 is it now visible from air? Have searched google maps .. I Hope this is of use!